Toy enthusiasts, hobbyists, and cosplayers will come together again as the Asia’s biggest and longest running convention for collectibles, toys, anime, comics, cosplay, and gaming character celebrates its 13th year of pop culture in the country. 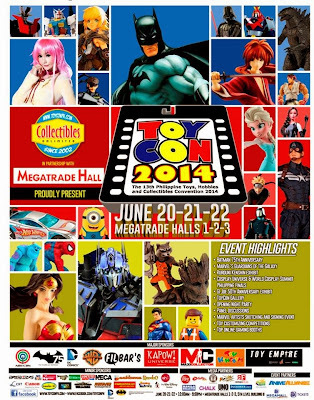 The Philippine Toys, Hobbies and Collectibles Convention, or TOYCON has been thrilling fans and aficionados alike since 2002. And this year’s TOYCON will highlight the 75th Anniversary of DC Comics’ caped Crusader, Batman. Aside from a huge Batman display area, there will be a life size Batpod, a kids’ activity area, booths with exciting new Batman merchandise, and a gallery of art and collectibles of the Dark Knight Detective. Warner Bros. has flown in original costumes from the sensational Japanese hit movie, “Rurouni Kenshin” and sequels “Kyoto Inferno” and “The Legend Ends” earlier. These authentic film costumes (designed by Kazuhiro Sawataishi) will be publicly displayed at the 13th Philippine Toys, Hobbies and Collectibles Convention 2014 this weekend. Preview of Marvel’s latest epic movie – The Guardians of the Galaxy, with awesome displays, sneak peeks at the movie’s trailers and behind-the-scenes, special fan activities, and the Marvel roster of superstar artists like Leinil Yu, Carlo Pagulayan, Stephen Segovia, Roy Allan Martinez and Kim Jacinto. The G.I. Joe 50th Anniversary exhibit, Philippine Lego Users Group exhibit, the Coca-Cola Collectibles exhibit, One Sixth Republic and Pinoy Sixth Scale collectors exhibit and the awesome Toycon Gallery exhibit area which showcases the best of the local toy group community. Parade of favorite Star Wars characters like Stormtroopers, Jedi Knights and droids and the Dark Lord of the Sith himself, Darth Vader as they invade the Philippine ToyCon stage. Moreover, gaming takes center stage with the biggest game companies like Level-Up, War Gaming, Cherry Credits and Uplink releasing the latest versions of their top games. The event will also feature the biggest in Cosplay with the Philippine Finals of the World Cosplay Summit happening at the event which my son will be participating. TOYCON’s own Cosplay Universe unleashes a barrage of individual and group cosplayers led by Asia’s Cosplay queen, Alodia Gosiengfiao. 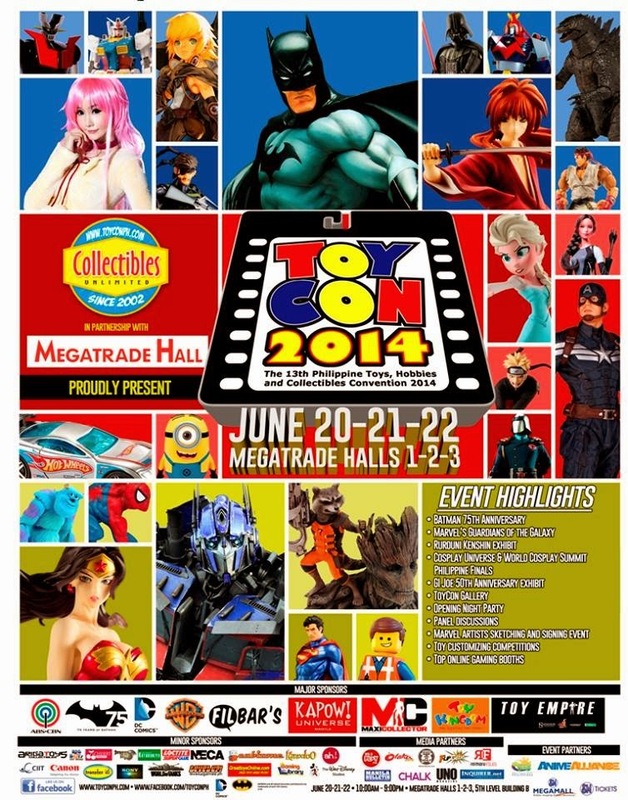 The Philippine TOYCON 2014 will be held on June 20-22, 2014 at the SM Megatrade Halls 1, 2 and 3, SM Megamall, Mandaluyong City.